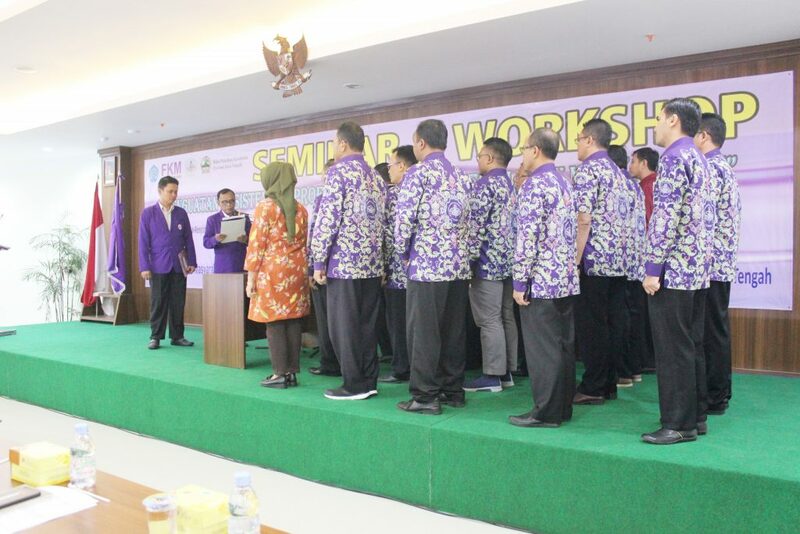 Semarang | The development of health situation in Indonesia requires that every health workers are obliged to register themselves to Indonesian Health Workers Council (KTKI) in order to get Registration Certificate (STR). The extention of STR demand a particular standard performance, so any refreshment and reinforcement related to knowledge and skill of online STR governance for health workers. Referring to that, Faculty of Public Health (FKM) Universitas Muhammadiyah Semarang (Unimus) in collaboration with The Indonesian Public Health Association Regional Central Java and Balai Pelatihan Kesehatan (Bapelkes) Gombong organised National Seminar and Workshop entitled “Reinforcement of Existence & Public Health Experts”, on Saturday (16/02/2019). 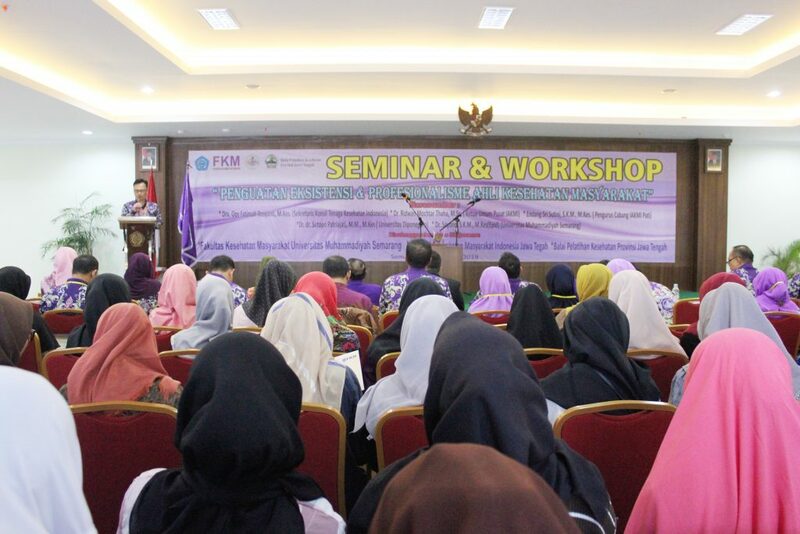 The event was conducted in Hall of FK Unimus and attended by hundreds participants both students and alumni FKM Unimus and member of branch and regional boards of IAKMI. Dean of FKM Unimus, Mifbakhuddin, S.K.M, M.Kes. also attended the seminar to welcome the hilarious participants. He stated that this agenda was realised by the active and positive collaboration between FKM Unimus and other institution. “It is such perfect collaboration and I really expect that later this activity will keep on going and continuing. Besides, it is expected that public health programs in Central Java will be well-developed.” he ended. There were two speakers in this seminar such as Ns. Yudi Mulyana, S.Kep. 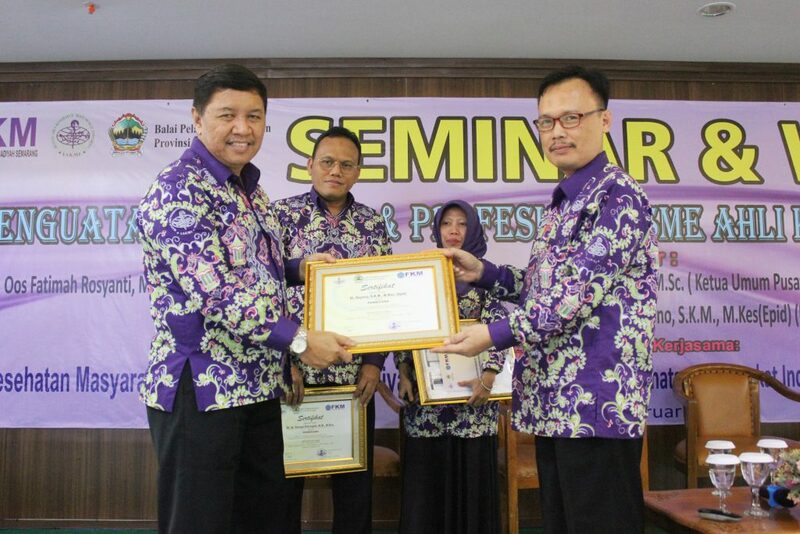 (STR online versi 2.0, Hakikat, Prosedur dan Kemanfaatannya), Dr. Ridwan Mochtar Thaha, M.Sc. (Tata Kelola Re-Registrasi STR Ahli Kesehatan Masyarakat). While in panel session three speakers were in charge such as Dr. Sutopo Patriajati, MM.M.Kes (Balai Kesehatan Masyarakat : Konsep dan Implementasinya di Provinsi Jawa Tengah) ; Endang Sri Sutini, SKM, M.Kes (Lesson Learned : Pembuatan SIK Ahli Kesehatan Masyarakat) ; and Dr. Sayono, SKM, M.Kes (Epid) (Strategi Pemenuhan SKP Penelitian Tenaga Kesehatan Masyarakat). This event was began by inauguration of Pengda IAKMI Regional Central Java and MoA signing between Bapelkes Provinsi Jawa Tengah dengan IAKMI Jawa Tengah.